One of the challenges for me as a plus size sewist is sleeves. I have very large biceps and upper arms. So choosing a blouse pattern is not just based upon bust, abdomen and hip measurements but also the sleeves. BTW, I nevah post pictures like this of my arms because in all honesty I'm not that thrilled with them. But hey we all don't like certain parts of our body - this just happens to be mine. I really want to make Butterick 5678 a princess seam blouse with cup sizes. Those cup size pattern pieces will make getting a good fit through the bustline much easier to achieve. The princess seams will also make alterations through the abdomen and hipline easier too. The challenge is of course the sleeve. I really want a sleeve with a placket because I see this pattern as a jump-off for a lot ideas for fall/winter sewing. But the sleeve...*sigh* My bicep measurement is 16" which means that I need a finished measurement of at least 17" to fit my arm comfortably. I like a looser fit in a woven. The finished measurement on this one is 16.5"- so I need to alter it. Since I want this to be a TNT pattern, I want to make the correct pattern alterations instead of the cheater methods I've used in the past. So I pulled my book, "Fit for Real People" by Pati Palmer & Marta Alto off the bookshelf to use the "proper" method to increase my bicep measurement. 1. I marked the center of the sleeve with horizontal and vertical lines as outlined in the first step. 2. Then I pinned the original to cutting my board. Cut the pattern piece and spread the vertical line a full inch at the bicep line. Next I taped the sides of the pattern and pinned it to my cutting mat. 3. Placed a piece of pattern paper over the altered sleeve pattern and traced a new sleeve making sure not to alter the sleeve cap. This gave me an additional inch in the bicep area of the sleeve which should work fine for me now. This was just the first of the pattern alterations for the shirt. Unless I come up with some really challenging ones, the rest will be detailed in the finished shirt blog post. It's really important that I get all the fitting and alterations right for this first one. Version one will be made from a blue cotton chambray which has been prewashed and is laying on the cutting table now. I will be working on this shirt this weekend. I shall be eagerly following along. as upper arms are one part of my fitting struggle, and somehow seeing how you handle alterations makes me feel like it is doable. I really want to be able to make a shirt/blouse that fits me. Your designs are always inspiring! I've done that sleeve alteration soooo many times, and Every.Darn.Time it never looks like it's going to do anything useful and it does. It just doesn't have to increase the armsceye to do it. I commend you for your frank photo. I am still coming to terms with my 56 year old physique. And then I remind myself it's a pretty small problem to have in the world today. We're alive, and our kids still like us. That's pretty good. I am just now getting into serious pattern alterations. I have always had buff upper arms but as my size increased the arm fitting has become increasingly difficult. I guess I should finally breakdown and purchase that book which has been on my wish list ever so long! My main challenge is having a broad back and a full bust. Even as a thin person I never found a button up shirt that fit properly. I am working up my courage to do my first full bust pattern adjustment. Wish me luck! Great idea to get a TNT of a shirt. One day I may get around to doing that too. (haha). Will you be sewing up a quick "muslin" just for the sleeve? Just an observation that your fullest part of your arm may be a bit lower than your bicep. But of course pictures are not always a good reflection and you know yourself best of all. Good luck! Nope - no muslin for me. Just going for it! I have struggled with this problem for years, but have never learnt how to fix the sleeves. I will copy this method and keep it handy - there might be hope for me yet! Now I just need to figure out my back fat issues :) Great post! This is how I alter my sleeves as well. Many post meno women (I'm one), have weight gains and/or shifts. For some it is in the midriff. For others and myself it has been in the arms and most patterns need an extra inch or sometimes two added in. I find the method you've shown works the best for me, too. Best Book Ever!! I use it for FBA's!! Myra - I'm with Carol! I think every sewist should own a copy of this book! Bravo to you for posting your not so favorite part of your body! My arms aren't high up on my list either. I always have to add to the sleeve circumference of woven patterns. Sometimes I have to open up the armscye too. Our bodies are so complex with all their curves and ratios. Great post! This fall, I am working mainly with patterns that I have made and liked the style of in the past. I need to get the fit correctly adjusted on a couple of them this time around so that they can truly become TNT patterns for me. At my house, we call them Jewish wedding arms. We all have them. Bette Midler says about the upper arms:: "After 30, your body has a mind of its own." I use this method as well. but I also like the seam down the middle for those who need more room and it doesn't lower the sleeve cap. I saw this on the Cutting Class where a fabulous Chanel coat on a skinny woman, so no need for extra room it was a design detail. The sleeve seam lines up with the shoulder seam and give a really nice look. For those of us who need extra room it's easy to add to the biceps while an inconspicuous dart can be used to keep the cap the same size. At any rate I think that getting a tnt shirt pattern is smart and something I need to do too. 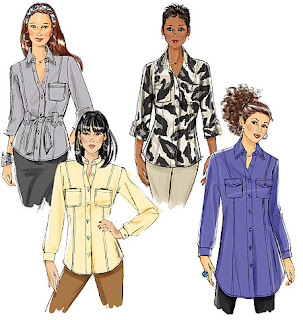 I keep putting blouses on my sewing list and never make them, one because I haven't made one in years and two because of fit. Nancy - I use the center seam down the sleeve ALL THE TIME! Because you're right it's the best for adding space where you need it without altering the sleeve cap. However, it doesn't work well with plackets - odd look - and I really want a TNT shirt pattern. This actually ended up working very well and I was pleasantly surprised! I use this technique for my biceps too and have always had good results. I also slash horizontally at elbow level on long sleeves because I invariably need extra room here as well. Paola - length is never a problem for me but that's a great idea. I'm gonna stow that one away because you never know when you'll need to use it! Do you have to add some cap height back in since you are reducing the cap height with your fix? The fix should NOT affect the cap height at all. That's the beauty of this alteration. I've used Zieman's pivot and slide method with good results too. Having a sleeve sloper is a great idea! WOw, thanks. I am putting off making a white shirt for this very reason. Does it work well with more than an inch. Probably 2? Also the center seam sounds intriguing. Do you taper it or does it add too much fullness to the sleeve cap? Thanks in advance. I love your blog, but don't say so much. Thanks from a plus size sewist !! I have this pattern and have made it, and it's a VERY nice to work with, and easy to alter, pattern. Just love it! Sorry it's out of print, I'm thinking it's time for me to get some cheap iron on interfacing and reinforce it, I plan to use it as my TNT for years to come.